Benita Prichette had been clean from her heroin addiction for nine years, had a job and a home in Philadelphia. Then the beast awoke, and in six months everything, especially her sobriety, was gone. She could keep squatting on a sidewalk and inject the drug that would give an intense, short-lived high. Or it could kill her, just like the 900 other women and men who died of a drug overdose in Philadelphia last year. 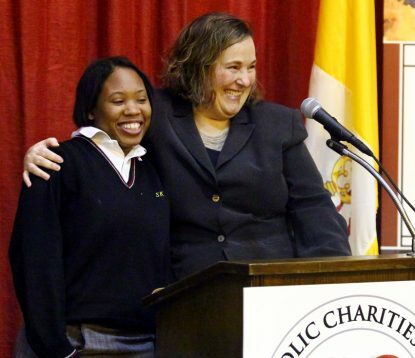 Prichette had a choice, and she chose to knock on the door of Mercy Hospice, a Catholic Social Services-run residential recovery program for homeless and addicted women and their children – the only one of its kind in Philadelphia. The staff took her in, offered a warm, safe and homelike environment, and helped her begin recovering again from her addiction. Five months later she was healthy enough to leave the home and find placement in a transitional housing program. Prichette had found hope at Mercy Hospice. And to help other women find hope as well, she joined Archbishop Charles Chaput this week in calling for generous support of the 2017 Catholic Charities Appeal. The largest annual fundraiser for the charitable works of the Archdiocese of Philadelphia serves more than 100,000 residents regardless of creed or background throughout Southeastern Pennsylvania. 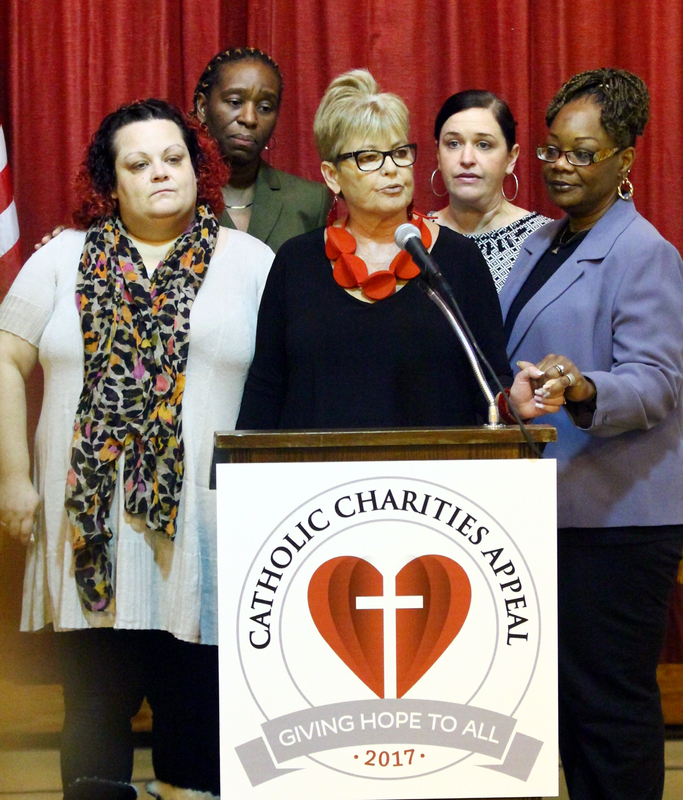 The appeal supports more than 180 church agencies and ministries including Women of Hope and St. Katherine Day School in Wynnewood, the special education school for children with intellectual disabilities, where the archbishop led a press conference Jan. 18. Last year the Catholic Charities Appeal, together with fund drives for individual church agencies such as Nutritional Development Services’ special campaign, collected $10 million. It was the fourth consecutive year that figure was met or exceeded, according to appeal organizers. Perhaps as significant as the dollar amount was the fact that the money came from 61,000 gifts from Catholics across the region. Archbishop Chaput expressed gratitude to all of those donors. “Each year people of good will come forward with outstanding generosity and dedication to feed the hungry, shelter the homeless, educate special needs children and offer aid to so many others who are vulnerable,” he said. 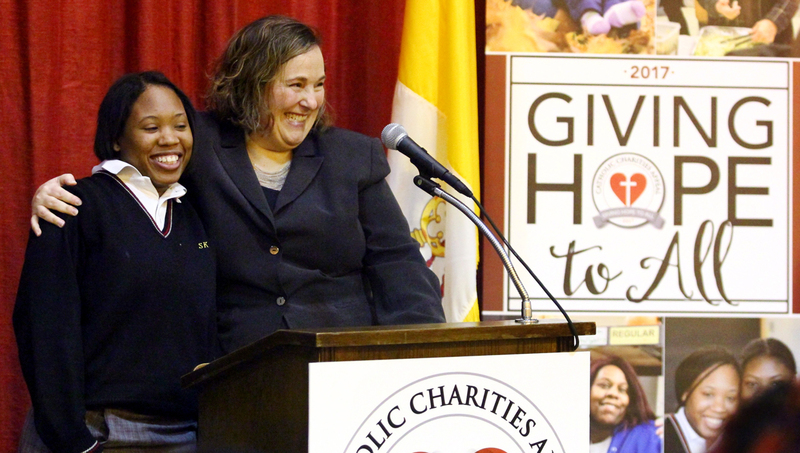 Traditionally the Catholic Charities Appeal benefits the substantial and long-time charitable outreach programs of the Catholic Church in the Philadelphia region. 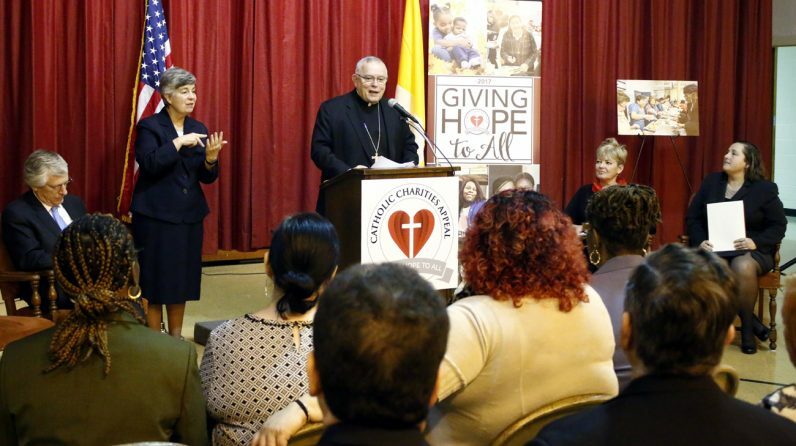 Last year, in an attempt to provide funding for additional archdiocesan ministries and outreach efforts at local parishes, church officials had hoped to direct any appeal funds over $10 million to those efforts. But that did not happen since the appeal itself, minus those additional fund drives, did not exceed the $10 million threshold. The goal of $12.5 million for this year aims to encourage in like manner the generosity of faithful Catholics. The appeal’s beneficiaries include church-run programs across five categories: four schools of special education; dozens of Catholic Social Services agencies and Nutritional Development Services; needs of retired clergy and seminarians; a group of 16 “mission parishes” in need of assistance in disadvantaged areas; and support of evangelization, parish and spiritual life throughout the archdiocese. Prichette, who joined Amy Stoner of Catholic Social Services in describing the work of Mercy Hospice and other social outreach efforts of the archdiocese, explained the most important aspects of the program, beyond the safe atmosphere for women living on the streets and seeking help. Prichette realizes she lost more than the material things she’d had when she became active in her addiction again. The greatest source of donations to the appeal comes from responses to its packet mailed to every registered household in the archdiocese, and those mailings go out beginning Jan. 26. Online donations can be made anytime at the website CatholicCharitiesAppeal.org, where more information about the appeal is also available.